Taken on Mar. 23, 1948, the interesting photo in this post shows the Douglas XF3D Skyknight performing its first flight, with Douglas test pilot Russell Thaw at the controls. The F3D, a large twin-engine night fighter developed for the U.S. Navy, had been trucked in to Muroc Army Airfield from El Segundo, California, for its flight test program. 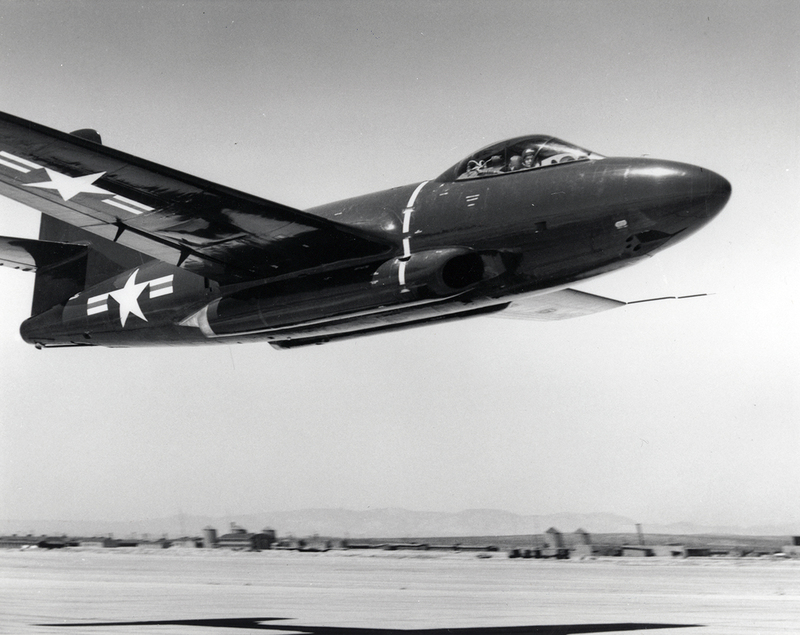 The Douglas F3D Skyknight (later designated F-10 Skyknight) was designed as a carrier-based all-weather night fighter and saw service with the U.S. Navy and United States Marine Corps (USMC). Its mission was to search out and destroy enemy aircraft at night. The F3D Skyknight was never produced in great numbers but it did achieve many firsts in its role as a night fighter over Korea. While it never achieved the fame of the North American F-86 Sabre, it did down several Soviet-built MiG-15s as a night fighter, with only one air-to-air loss of its own against a Chinese MiG-15, which occurred on the night of 29 May 1953. Furthermore the Skyknight played an important role in the development of the radar-guided AIM-7 Sparrow missile which led to further guided air-to-air missile developments. It also served as an electronic warfare platform in the Vietnam War as a precursor to the EA-6A Intruder and EA-6B Prowler. The unusual, portly profile earned it the nickname “Willie the Whale”. Some Vietnam War U.S. Marine veterans have referred to the Skyknight as “Drut”, whose meaning becomes obvious when read backwards. This may be in reference to its age, unflattering looks or its low-slung air intakes that made it vulnerable to foreign object damage (FOD).